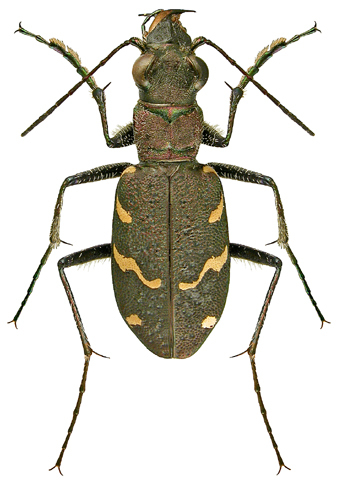 Heath Tiger Beetle or Wood Tiger Beetle. Pattern colour: Elytra marked with pale yellow basal and apical spots and central narrow curved band. Outer edge of mandibles pale yellow. 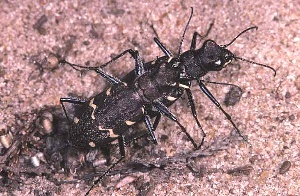 Leg colour: Black with metallic reflections. Status: Scarce. Very local in Dorset, Hampshire and Surrey. Other notes: Elytral surface roughened, with irregular depressions as well as smaller punctures. Labrum black with sharp central ridge.